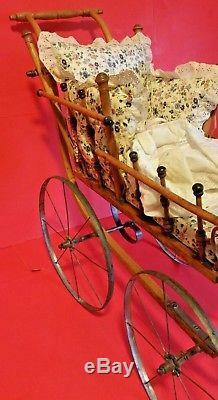 RARE Antique 1800's 4 Metal Wheeled Doll Carriage W/Push Handle & Jointed Porcelain Doll. 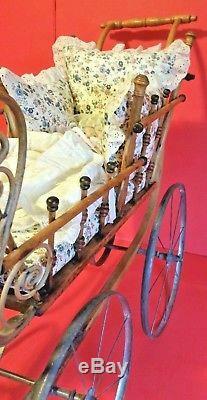 Very Uniquely Rare Ornate Wooden Victorian Doll Carriage. Metal Wheels and metal spring suspension. 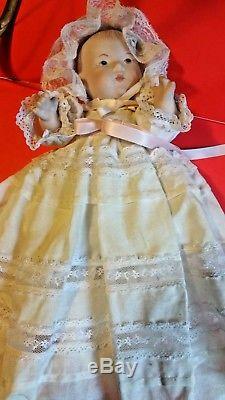 Includes: Antique 7-1/2 inch Porcelain Jointed Doll (Originally came with carriage). And padded side bumpers and mattress. 7 wide X 16 long (inches). Handle- is 24 inches off ground. Width rear -outside hub of wheel to outside hub of wheel = 14 inches. Front= outside hub of wheel to outside hub of wheel =13-1/2 inches. Plank bottom 8 X 17 inches. I have white circles with arrows pointing our areas where areas have been repaired (sewen) in the past with black thread. These small repairs have never been an issue with us as we have always used this carriage as a prop for displaying antique dolls. It has always been popular. The second from the last photo I show displays a missing decoration on the back of the seat, that broke off. Bad as that is, it has always been that way since we go it. There are no stress fractures on handle; no rust on metal parts; no rot on any wood. With us it has always been used inside our heated home, free from smoke. As is the case with all of our antiques, because of our age, we must part with this now. Front: 10; Center 11; Back 12 inches. 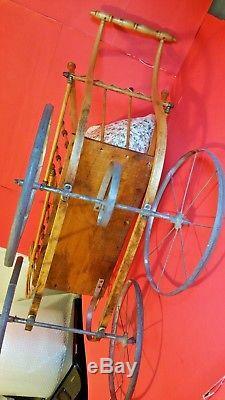 The item "RARE Antique 1800's 4 metal Wheel Wood Doll Carriage Vtg Jointed Porcelain Doll" is in sale since Friday, October 12, 2018. 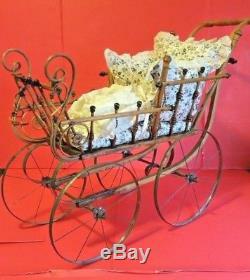 This item is in the category "Antiques\Home & Hearth\Baby Carriages & Buggies". 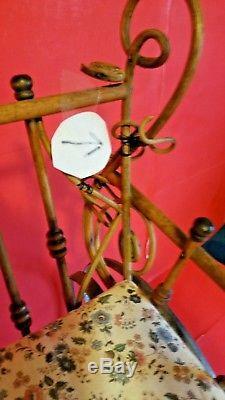 The seller is "bobsvintageattic" and is located in West Henrietta, New York. This item can be shipped to United States.